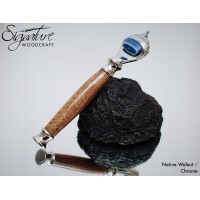 Our range of carefully crafted handmade shaving brushes and handcrafted razor handles. These products make an ideal gift for any gent who enjoys a wet shave. Complete shaving sets are also available, along with premium grade badger hair brushes. Our double-edged safety razors are made using the finest selected materials with the utmost care and..
What better way to shave than with your own custom made Razor? Simple yet elegant, and very pe.. The Kingsman is a quality, finely handcrafted shaving brush with a single chrome cap for the brush b.. 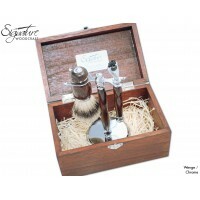 The Kingsman is a high quality, finely crafted shaving set. It features a Mach3 or Safety Blad.. The Kingsman is a high quality, finely crafted shaving set. 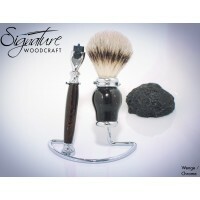 It features a Mach3 compatible raz..
Our Squire Shaving Set is an ideal gift for any gentleman that enjoys a wet shave. The set fea..
A luxury quality shaving brush with chrome end caps. The bottom end cap is weighted so the bru.. 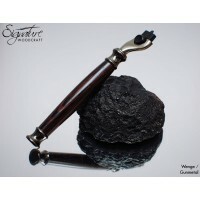 The Viscount is a high quality complete shaving set. It features a Mach3 compatible razor hand..
Our essentials shaving set includes our Mach 3 razor handle and our genuine badger fur shaving brush..